Navigate to the blog in which you wish to create a new entry by using the blog selection menu. Click the “Write Entry” button in the main menu, or choose Create > Entry in the main menu. This will display the Create Entry screen. The following entry fields are available in Movable Type. Entry Title. Use this field to title your entry. It is displayed on your blog using the MTEntryTitle tag. Body. Use this area of the Create Entry screen to compose the body of your entry. 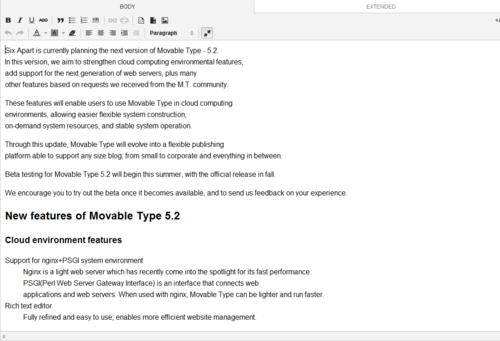 Movable Type supports a variety of different text editing and formatting options. The body is displayed on your blog using the MTEntryBody tag. Extended. Use this area of the Create Entry screen to compose any extended text of your entry. This field is typically used to display more information in an entry on an individual entry archive while the main page of your blog has the “body” of the post. The extended entry is displayed on your blog using the MTEntryExtended tag. By choosing the “rich text” format option, the user’s text input field will switch to WYSIWYG mode. All buttons have been redesigned, and the editor now supports HTML styling. By clicking the [</>] button located in the top right corner of the editor, the input mode will change to plain or HTML editing mode. Click the same button again to return to WYSIWYG editing mode. For any other format selected, as well as sub-formats, such as [html editing mode] inside [rich text] format, the buttons and options within the editor will change accordingly. With text selected, the opening and closing tags will be inserted before and after the selection. The cursor will then appear immediately following the closing tag. The opening tag will be inserted before the cursor. If the same button is clicked again, the corresponding closing tag will be inserted next to cursor, with the cursor moving to a new position following the tag. By clicking the [full screen button], the display will change to full screen mode. If the same button is clicked again, the display will return to the default size. You can now define your own CSS specifications for the text editor. This in turn makes it possible to easily assign different graphic styles between blog entries and web pages. Click [Settings] > [Compose] in the website/blog navigation menu. Then, link the style sheet using the full URL address, or other way. The CSS file should become effective on the defined website/blog after clicking the [Save Changes] button. When using rich text mode, Movable Type can specify different graphic styles for blog entries and web pages via the linked to style sheet. Defining the two classes [body.page] and [body.entry] makes it easier to individualize graphic styles between pages and entries. You can also define the CSS file for the text editor in the theme.yaml file within the Theme. Tags. Use this field to enter tags for your entry. Learn more about tagging entries and pages and managing a blog’s tags. Tags are displayed on your blog using the container tag MTEntryTags. Excerpt. Use this field to enter an excerpt for your entry. Entry excerpts are not in any of Movable Type’s default templates, but can be displayed on your blog using the tag MTEntryExcerpt. The status of the edited content. If you activate the revision history ( on Movable Type 5 ), you can restore previous items saved in the history. “Save Draft” Button - Save as “Unpublished (Draft)”. 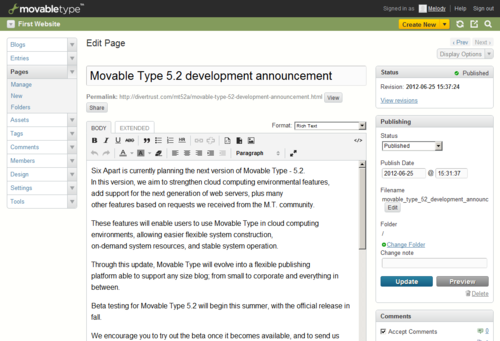 “Publish” Button - Publish a blog entry or webpage to the site. “Update” Button - Make changes to published content. “Unpublish” Button - Unpublish a blog entry or webpage and revert to draft status. “Delete” Button - Delete a blog entry or webpage. Publish Date. Use this field to set the publish date for your entry. 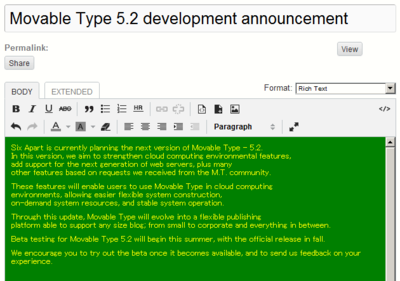 If you set the publish date for the future, Movable Type will publish the entry on that date, as long as your system administrator has configured a cron job for running periodic tasks. Learn more about running periodic tasks. Basename. 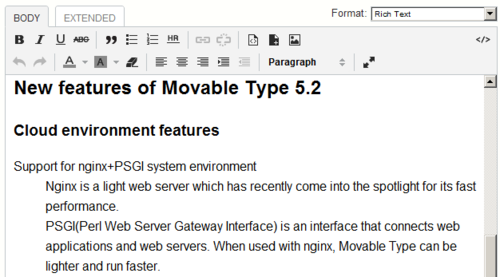 Movable Type will automatically populate this field with a file basename for your page. For example, if your entry title is “This is a new page” the page filename will be “this-is-a-new-page”, and hyphens will be converted to underscores depends on the Archive File Path Specifiers. If your default file extension for entries is set to “html” the full file name of the page will be “this_is_a_new_page.html”. 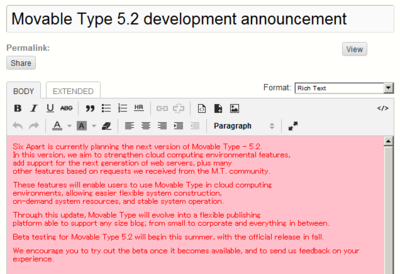 Change Note If the revision history (Movable Type 5 only) is activated, save a memo regarding saved revisions. Use this area of the Create Entry screen to assign categories to your entry. To assign a category to an entry, click the “Add Category” link. Learn more about managing categories. Accept Comments / TrackBacks. Use this section to set whether comments or TrackBacks will be accepted on the entry. The default for new entries can be set by your blog administrator (or by you if you have blog administration rights). Learn more about new Entry settings in Movable Type. Outbound TrackBack URLs. Use this field to enter URLs for sending TrackBack pings when your post is published. Movable Type can be configured to automatically discover TrackBack endpoints to ping when you save and publish your post. Learn more about configuring TrackBack settings in Movable Type. The system will automatically save your entry to the database every 30 seconds, after your cursor has left the Entry Title field. The system saves your entries to a separate table from the main entry table, and makes recovered entries only available to the user who was editing the entry when it was auto-saved. If the system has an entry available for you to recover, it will present a message at the top of the Entry editing screen. Use the display options tool on the right hand side of the screen to select which editor fields you wish to display on the Create Page screen. 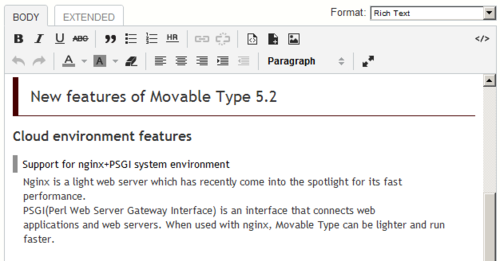 Won’t Movable Type use the entry basename to create the entry archive page using the format specified in the archive mapping? Specifically, if my entry mapping is set to “yyyy/mm/entry-basename/index.html” then the full file name of the entry would NOT be entry-basename.html as you’ve stated above. Do I have that right? Also, it should be noted that under Safari 2.0.4 (Mac): Ã¢â‚¬Â¢ Inserting an image — if in Rich Text mode, the image won’t appear in the entry. Switch to Format: “None” and the code for the image will appear and everything will work fine. Ã¢â‚¬Â¢ There’s no color-highlighted code in the templates and modules — it’s all black text. Ã¢â‚¬Â¢ Certain features of Rick Text mode, such as converting text to lists, don’t work. Again, switching to “None” mode seems to resolve the issue. You can then switch back to Rich Text to see the results. Firefox 2(Mac) seems to not have these issues. Does Moveable Type have a spell check feature, or if not is there anyone currently developing a plugin for a spell check feature? ps - feel free to move this to another section where it might be more appropriate. “Status” could use some explaining especially for people who use the run-periodic-tasks script to publish entries at future times. This took me some trial and error to figure out. “Published” creates the static page immediately, but waits until the time specified to update the indices (and only the indices that have been marked to use the publish queue). “Scheduled” does nothing until the time specified, then it creates the static page and updates the queued indices. I’d be happy if the “Learn more about running periodic tasks” link actually went somewhere and told me how to set up a cron job. I guess I’ll need to do a Google search. Sigh. When I publish it, it works fine. But when I go back in to edit the post, It shows a square where the video should be, but the editor no longer works. Clicking on “Toggle HTML Edit Mode” does nothing. I also can’t switch from the Body to Extended views. It seems that embed code above breaks the editor. And if I save/publish again, it breaks the video. I’m surprised there isn’t an embed feature to the editor. Surely I can’t be the only person that wants to embed a video on a blog entry. @iwin: Have you checked file permissions? You might not have enough privileges?